By that I mean it's great to know people who are not Yankee fans, like Beardy. Beardy is a Baltimore Orioles fan, and by nature hates the Yankees. 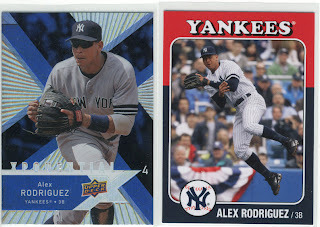 I'm okay with that because that means Yankee Stadium Legacy cards and a variety of goodness that came in the mail the other day. Here are some of the cards Beardy sent over. There were also a bunch of YSL cards to make my collection a smidge closer to completion, not that I see that happening at the rate I am currently moving along at. I'm very grateful for all the friends I have made through the blogosphere, and for their continued generosity. I am currently on a brain break because I can't see straight anymore from reading my notes. My poor card collection has felt so neglected in the last week or two because I have barely done much of anything, I have piles of mail sitting around waiting to be sorted, logged, and put into binders that I just haven't done. I'm not very good with time management, and tend to over-stress on beating information into my brain rather than managing my time so that I don't feel looney by like 10pm. I hear ya, my collection has been sorely neglected since the new addition to the family. I can't remember the last time I logged a YSL card. I think I've been stuck at 1150 for weeks. 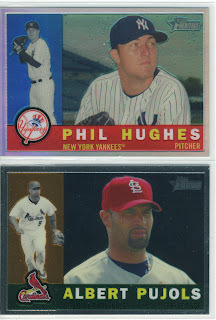 Yankee cards deserve a good home too. Just not in MY home!